Chhattisgarh was felicitated for emerging as one of the best performing states in the renewable energy segment dated 15 February 2015. 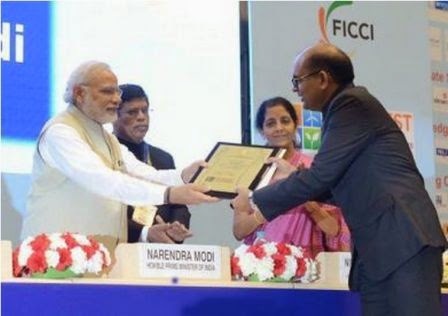 Principal Secretary of Chhattisgarh’s Energy department, Aman Singh was presented this award by Prime Minister Narendra Modi during the first Renewable Energy Global Investors Meet (RE-Invest) 2015 held in New Delhi. The state was adjudged this award on the basis of criteria fixed by 13th Finance Commission headed by Vijay Kelkar. "Chhattisgarh has been doing commendable work in renewable energy sector. We are generating 45 MW off grid solar power and 200 MW through rice husk," Singh told PTI after receiving the award. Chhattisgarh has done commendable work in renewable energy sector. Currently, solar power is powering 600 primary health centre, 100 community health centre, 350 police stations, 1800 tribal hostels, 27 collectorates and 1,700 villages of the state. In addition, various villages in Chhattisgarh are using 3,000 solar power pumps for drinking water and 1,500 for irrigation purpose. State is generating 45 MW off grid solar power and 200 MW through rice husk. eChhattisgarh.in | Chhattisgarh History,Tourism, Educations, General Knowledge, Introducation, History, Industries, Political, Tourism, Colleges, Universities, Jobs, Exams, Results, General Knowledge, Chhollywood News.